LRS metadata provides the ability to assign required LRS "semantics" to your data - such as "Route ID Field Names", "From Measure Field Names", "To Measure Field Names", and other LRS information, which is necessary for various applications to consume the data. If your map service has LRS metadata exposed via LRS Server extension for ArcGIS Server for a given event layer, no additional LRS metadata configuration is required for standard functionality. 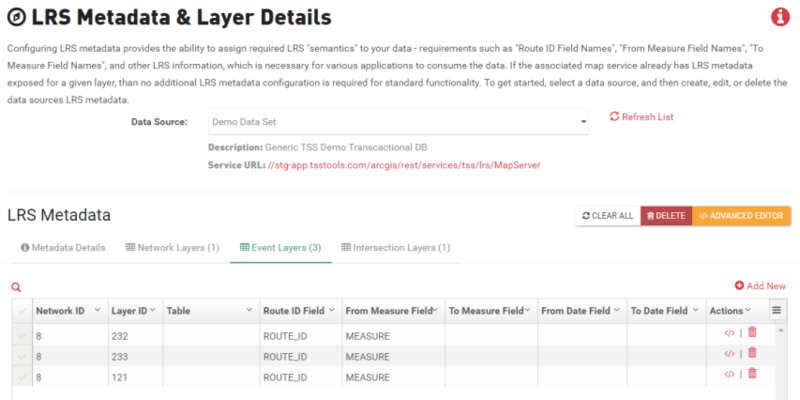 If your map service does not have layer metadata exposed via the LRS Server extension, you'll need to add and configure any layers here that your applications need to consume data from. To start, select the data source from the dropdown that you wish to configure LRS metadata for, then follow the instructions below for each layer option. Enter a Name for your metadata details. Check the box for Service URL has additional LRS metadata. Note: When this box is checked, it will notify your applications to query the LRS Server to pull and access layer metadata. Insure the check the box for Service URL has additional LRS metadata is not checked. Note: When this box is not checked, your applications will not query the LRS Server for layer metadata. You will need to add any layers you wish to query in the appropriate sections of this tool. For non- ArcGIS LRS Server Extension users, all layers and layer fields you want applications to have access to, must be configured in these tabs. Remember, if you're using the LRS Server extension, layers exposed through that extension don't need to be added. However, that doesn't mean you won't have any layers configured here. For example, you may have multiple network layers or tables added to the map service that aren't exposed through the extension. Those items would still need to be set up here. The minimum requirement when adding a new layer is the Network ID, layer ID, Route ID field and the From Measure field. Some applications may also require additional fields to function correctly. For example, in addition to the above required fields, Segment Analyzer also needs to know the Table Name so it knows where to write the output to. Click the tab you wish to add the layer too. Click +Add New or +Add New Layer Configuration to add an empty row to the list of layers. Double click fields to enter layer details into the table. Double click the field you wish to edit. To open the editor, click </> in the Actions column of the row you wish to edit. Click the JSON code you wish to edit, and make your edits. Click the tab you wish to remove the layer from. Click Delete (trashcan) in the Actions column of the row you wish to delete. The Advanced Editor gives you a JSON view of all configured metadata layers and allows you to edit the raw JSON code.